This station doesn't have escalators or elevators. It's a flight of stairs down and then 2 flights up. Good grief. Not something I'd want to do at the best of times with my luggage, let alone first thing in the morning after a long train trip. There's quite a bit of construction going on at the station so it's a bit of a trick to exit. Somehow I manage and find a taxi quite quickly that takes me to the b&b. 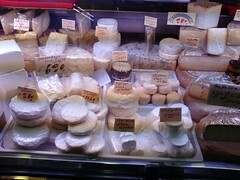 So far my Italian is holding up - I just have to get over the self-conscious thing, after all I am in Italy! 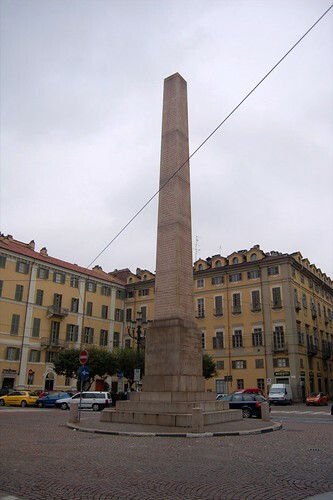 I'm deposited in quite an interested intersection - Piazza Savoia, with it's obelisk sitting in the centre. 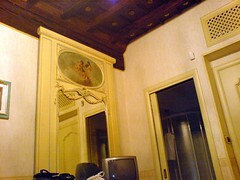 The B&B is in the former Palazzo Saluzzo (built between 1715 and 1722) and I'm met again with another flight of stairs. Thankfully, Roberto, the host comes down and takes both the bags up to the apartment. Obviously he didn't go to the same school as the jerk from Vienna. The train is just 45 minutes late so the room is ready - it's quite lovely, but alas, no phone, no internet. He hopes that next year he'll have internet but it's difficult to get things done in these historic buildings. 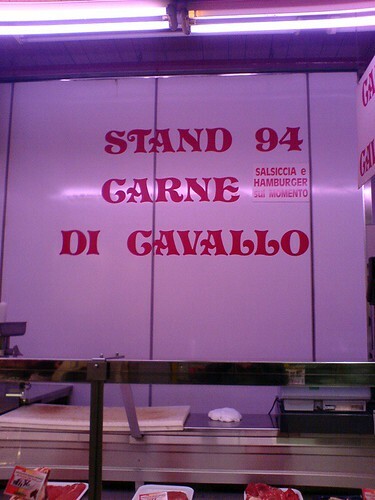 Ah yes, Italian bureaucracy you've got to love it. He also supplies me with a map and some information and before long I'm off to explore a bit - excuse the photo quality as I'm only armed with the camera-phone. 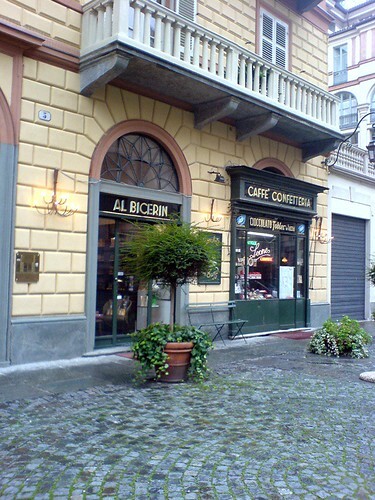 First stop for me is a visit to Caffé Al Bicerin and lucky enough there's a table free inside. This place only has 8 small round marble topped tables and yes I order a bicerin. There's no picture because I felt a little self-conscious. What exactly is a bicerin? It's a mix of coffee and a secret blend of chocolate, over the top rests a bed of cream. You swirl it all together as the chocolate can sink to the bottom and then drink and enjoy. It's not an overly sweet drink, the chocolate component is of a dark variety, high in cocoa. 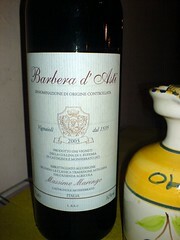 Overall, very enjoyable and very easy to drink. The €4 price imposes it's own limit. Opposite Al Bicerin is the Santuario Della Consolata, which houses one of the most beautiful interiors I've seen this whole journey. It really is glorious. No photos since none are allowed - as the signs say, this is a place of worship (it's just wrong that some tourists fail to appreciate that fact). A short stroll from here and I stumble upon a market - and this one is huge. I've read later on that this is the largest in Europe. Unfortunately there seems to be a bit of work gong on - more than likely due to the Olympics but I still manage to have a good look round. The first part I go through is the Fishmongers - a large building with a central walkway - fishmongers line the path and vie for your business. A kilo of calamari for €2 sounds good to me but without I kitchen I can only ogle the fish. There are also a few religious statues dotted through the building, with candles lit as an offering. Exiting the building I come upon the open air sections - this one offers clothing, household items, virtually anything you can think of. This leads to another enclosed building (The Orologio Building) this houses a multitude of stalls - delis, butchers, poulterers, bakers etc. 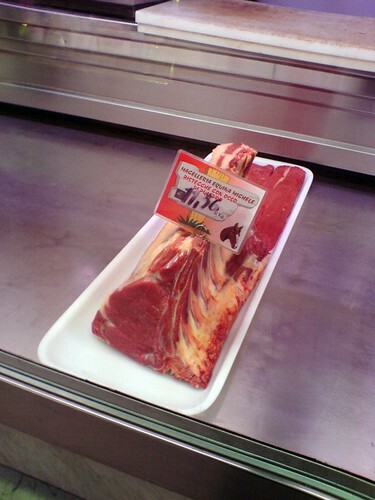 The array of food is quite outstanding - it's interesting to see that the meat isn't as prepared as we are used to seeing, there aren't any cut steaks as such, the meat is presented as slabs and then are sliced to order - not a bad way of doing it if you ask me. 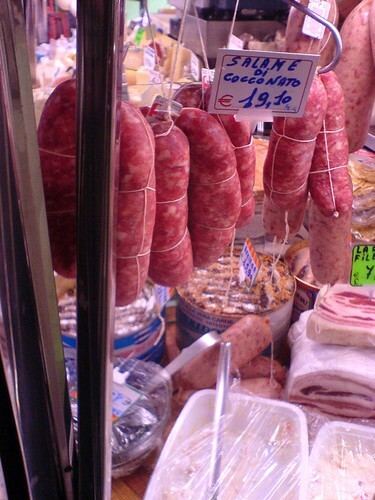 I purchase some Prosciutto Emiliano - never knew it even existed and a little piece of Tallegio. Coupled with some of those incredibly crusty rolls, it makes for one exceptionally tasty lunch. 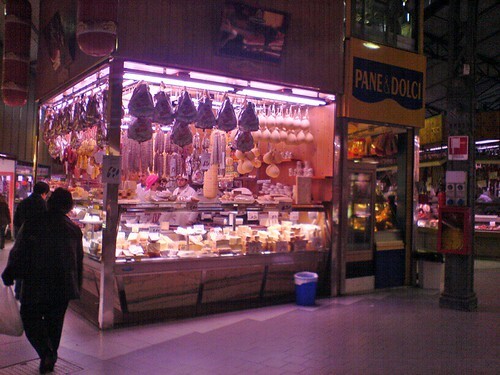 In fact the stall where I purchase the prosciutto from had another dozen or more types from different regions - I chose Emiliano as it's my mother's region. Bread is also priced by weight - something I saw in Germany as well. 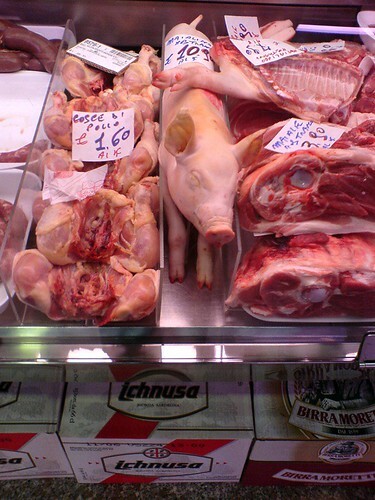 A word of warning - I do believe that the market shuts down around 1pm - it's something to be vary of when in Italy, things close down for a bit of siesta. Leaving this section of the market I come upon the open air fruit and vegetable section - it's also closing down so there are plenty of bargains to be had. 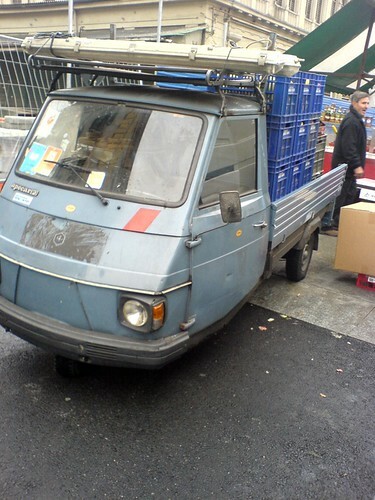 It also seems that the vehicle of choice for stall-holders are one of these 3 wheeled things, the affectionately named "Ape". 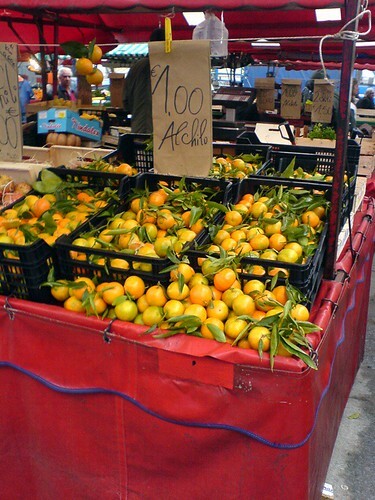 I also purchase a few of these lovely Mandarins before returning to the b&b to enjoy my goodies. After lunch I head off again, this time with the good camera to find Piazza Solferino and the Information Centre. 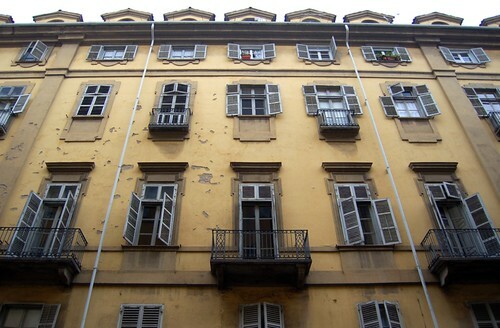 The one thing that is catching my eye are the windows and shutters and the facades with their balconies. 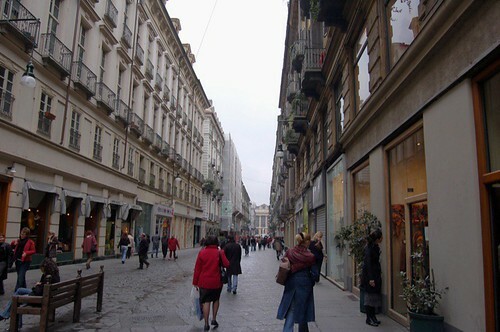 There are also attractive side streets and pedestrian only areas and little piazzas dotted throughout. It really is quite a lovely city. Piazza Solferino is also undergoing a bit of construction work - this is definitely for the Olympics as it's also the Olympic Information HQ. 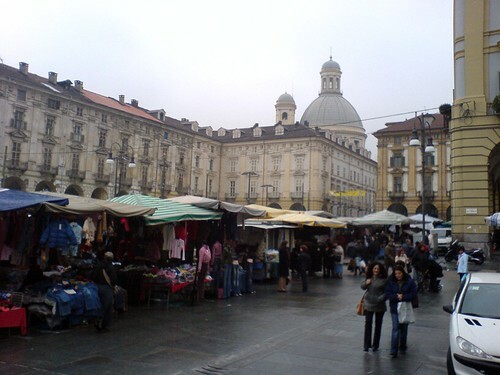 It's here, when I finally work out where the tourism section is, that I purchase a Torino Card - it gives me free transport and entry to museums and galleries. When I ask for a transport map, I'm told that they don't have any, I'll have to go to Stazione Porta Nuova. Unfortunately without any idea of where the buses and trams go, I can't actually work out how to get to Porta Nuova from here. I opt for a quick solution - time for a taxi. The area around Porta Nuova is also under construction - okay I'm seeing a recurrent theme happening. I line up in the queue to talk to information. They have this odd system where you have to wait outside so to give people privacy - it's almost like a confessional. Eventually it's my turn and I'm told that they don't have any and am directed to another section of the station. Another wait and yes, they don't have any either but direct me to another booth at the opposite end of the station. Who would have though getting a public transport map would be this difficult? No queue this time but I'm told that they don't have any either and to check with the main office, which is, naturally, down the other end of the station. It's here that I'm left bewildered. Apparently they don't have any more maps - the print run is finished and that's it. No more maps. Nothing at all. So I've got a ticket that I can use on the public transport system but no idea of where anything goes. Hmm, this really really useful. I can hear you say, look at the tram stops - ah yes, it would indeed make sense to have route maps at the tram/bus stops with timetables, but we are in Italy. That's just way too logical. You don't know where things go and you don't know how often or when they arrive. I can see I'll be doing a lot of walking. So ever so slightly ticked off it's time for another taxi to take me back to the b&b. 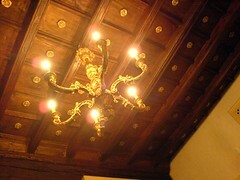 I've taken a few photos of my room - it's only the camera-phone so they aren't the best - I love the wooden ceiling though. I go for a bit of a stroll after 7 in the hopes of finding a nice place to eat. I come upon an empty restaurant (Aldente Trattoria Italiana) not far from the b&b - it's only empty as I've arrived when it's just opened for the night. 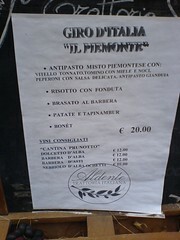 They offer a special menu that highlights specialities of the region and for €20 it seems like a good deal. 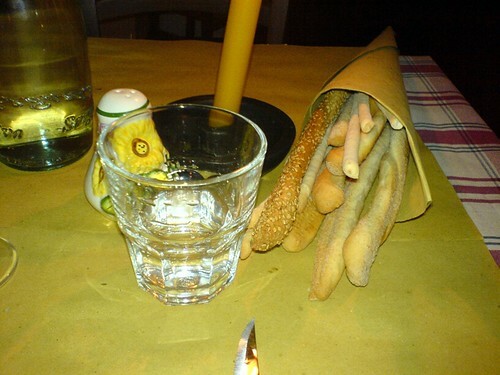 After ordering, a cone containing various grissini and breadsticks is brought to the table. They look and taste fantastic and if that isn't enough a basket of sliced breads is also set on the table. There's a particularly delicious olive bread, still warm from the oven. Since this is my first real meal in Italy I decide to really enjoy the experience and order a bottle of red as well. 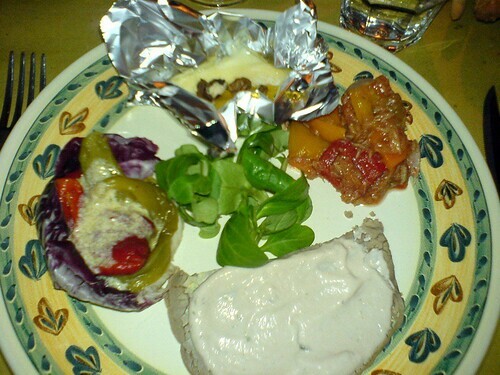 The first course is Antipasto Misto Piemontese consisting of Vitello Tonnato, Tomino con miele e noce, Peperoni con salsa delicata and Antipasto Gianduia. The photos are not doing justice to the food - cheese (Tomino) is presented in a foil parcel, it's been warmed so it's just beginning to melt, combined with the honey and nuts it is sublime, so simple yet exceptionally tasty. The peppers (peperoni) are slow roasted and sweet and just melt in the mouth. Antipasto Gianduia are pickled vegetables that are served in a tuna based tomato sauce. The thin slice of veal (Vitello) are covered in a the delicate tonnato sauce. Every mouthful of this course is a delight - it's already the best meal of the trip. I mentally chastise myself that it's taken me so long to get to Italy, why oh why did I go to Hallstatt? Second course arrives piping hot and freshly made. 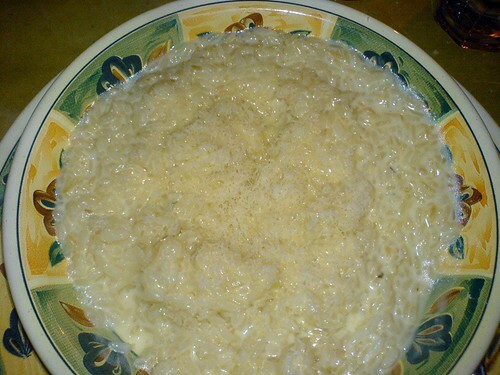 A large bowl of risotto (Risotto con Fonduta) - you are offered a slab of Parmigiano to grate as much or as little as you like. The risotto couldn't be more perfect - the grains lacking any of that nasty bite, it's exceptionally creamy and the fontina has just melted down to form the perfect base. It's amusing to consider some of the risotto we get back in Oz, where the chef's insist that you need crunch in the rice. That's just rubbish. There's nothing worse than crunchy risotto - it's not meant to be crunchy. Talk about talking al dente to a ridiculous level. Are they making risotto or fried rice? 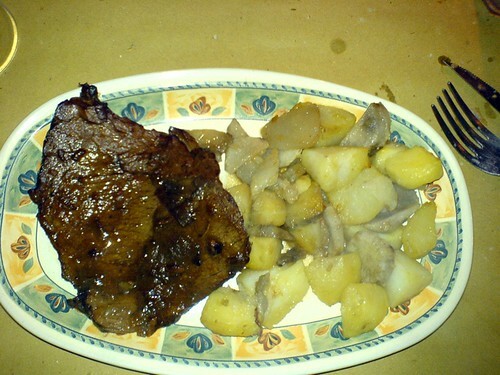 A slice of beef slowly cooked in Barbera (red wine of the region) and served with roasted potatoes and Jerusalem artichokes. The meat didn't need a knife to cut, it just fell apart. 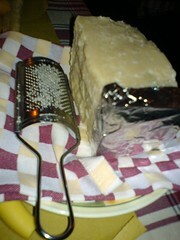 The final course is Bonet - a traditional dessert of Piemonte. 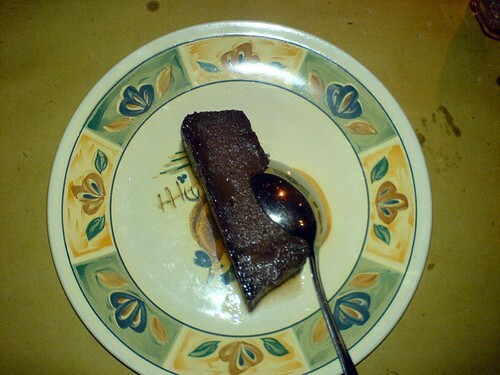 A chocolate, almond, rum mixture, denser than a mousse but incredibly luscious. To finish, a caffé macchiato and indeed it was a perfect finish to the meal. I really can't stress enough how good this meal was and it's exceptional value. When I leave the restaurant is full and I am extremely happy and impressed. Even with the frustration I can't wait for tomorrow. Imagine my surprise when I googled this restaurant - I just returned from a trip with my girlfriend to Turin and we stumbled upon Al Dente quite accidentally one night. 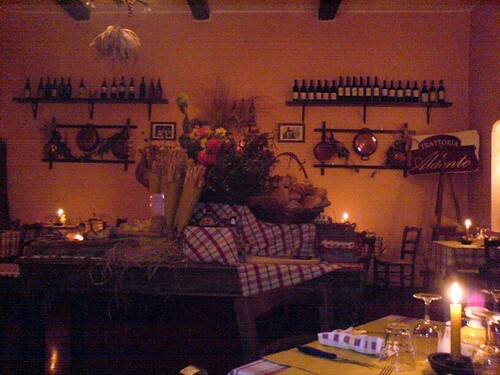 It was the best meal we had on our entire trip, with every dish being exceptionally good. Hi Aaaron - that is great to know that Al Dente is still going strong.